I have paired this image with the new Hill and Dale die set. How fun is this set? I layered one hill over the patterned paper and popped up the other. 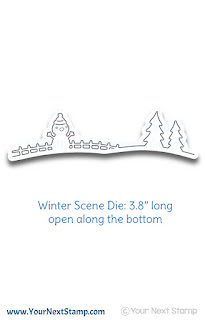 The image was stamped directly onto the main hill panel and additional snowflakes were stamped throughout. I had this idea of adding some jingle bells I had, which I did, but I think maybe it was not a smart move. LOL! Or maybe I should have added one more. Well, it's there and and it jingles! I finished the card with some crystal Stickles along the hills, trees, and snowflakes. 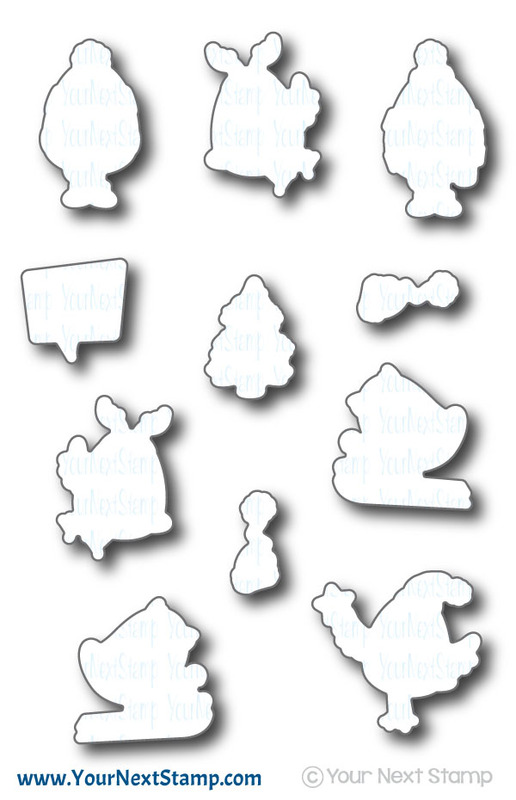 Be sure to see all the fabulous creations from the Cat Pack here and add this fun set to your list! Thanks for stopping by! 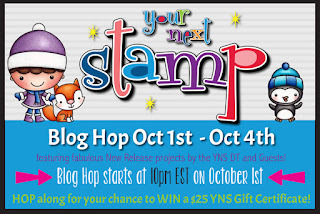 It's a warm and wintery release this month for the October Release of The Cat's Pajamas Stamps! 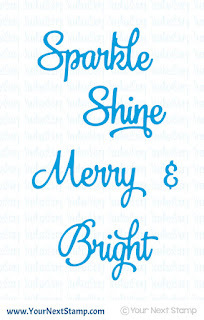 Not only are the sets fabulous and full of holiday cheer, but the sentiments really make the sets come alive and make you giggle. Today is TCPTUES325 and it's all about beverages! The DT have tied this in perfectly with a soon to be released set perfect for that warm beverage lover! 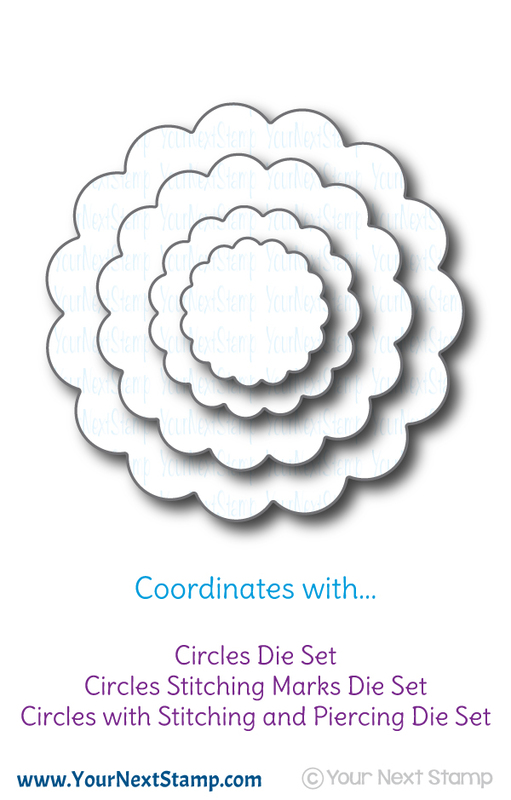 I paired this with the soon to be released roller die set to make for fun, interactive projects. We sure hope you will join along in our challenge and don't forget to check back each day to see all the fun sneaky peeks! Thanks so much for stopping by and hope you have a great day! It's another DT dare with Your Next Stamp and we were challenged to create a square card. I just love making cards that are out of the normal A2 size that we mostly get into the rut of making. The downsize of different size cards are finding the envelopes to fit them. 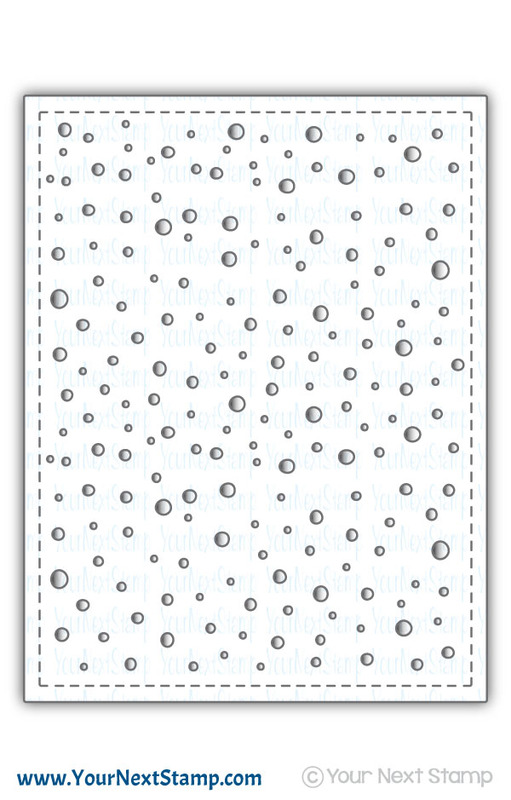 However, for my card, I made this a 4.5"x4.5" size AND I happen to have envelopes to fit it! :) Win win! 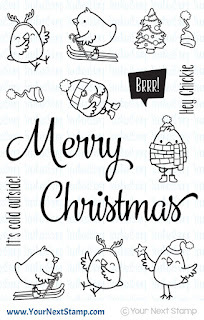 For my card, I am using the newly release set of Merry Christmas Chickie. This set is adorable and so much to create scenes with. 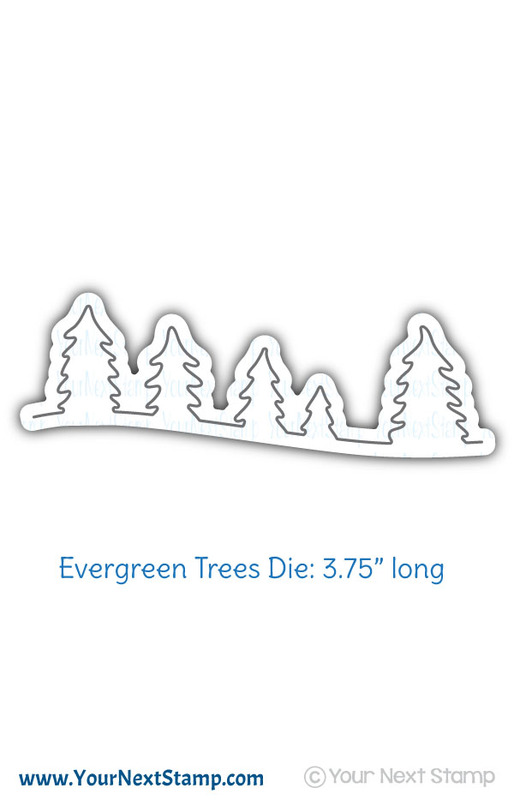 Added to the scene I created is the newly released Evergreen Trees die. Once I cut the base card to size, I used the Stitched Square Frame die to cut out the frame with some patterned paper. I colored the images with Copics and then used the coordinating dies to cut them out. The trees were cut out with the die and I added some white gel pen to the trees for a snowy effect. 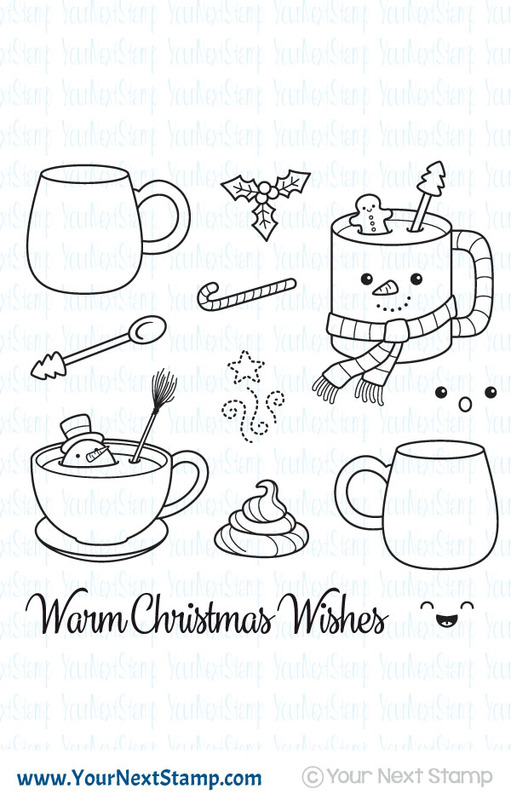 The images were popped up and the card finished with some Holly Jolly gumdrops. 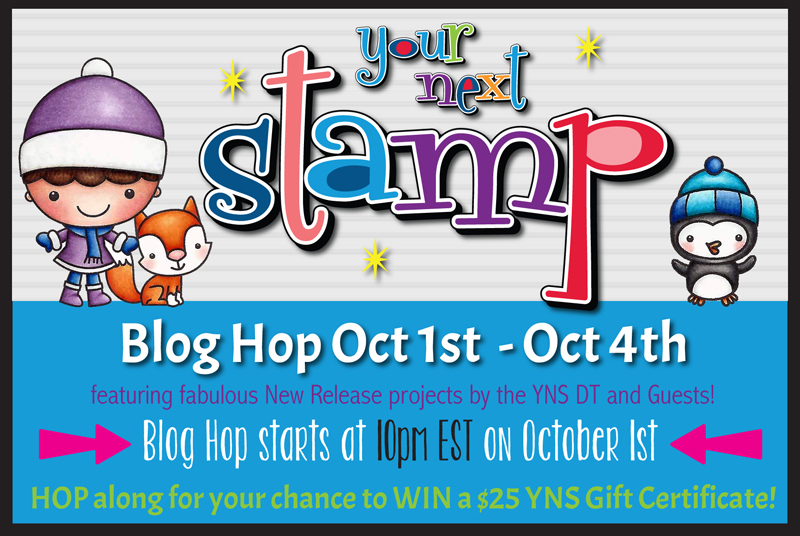 Be sure to stop by the YNS Blog to see all the fab creations by the DT and leave a little love! Thanks so much for stopping by and have a great hump day! Did you enjoy all the YNS sneak peeks for this fab release? The DT definitely rocked it and there is more to see as you hop along. I hope you have your list ready, because there is an awesome deal you don't want to miss. 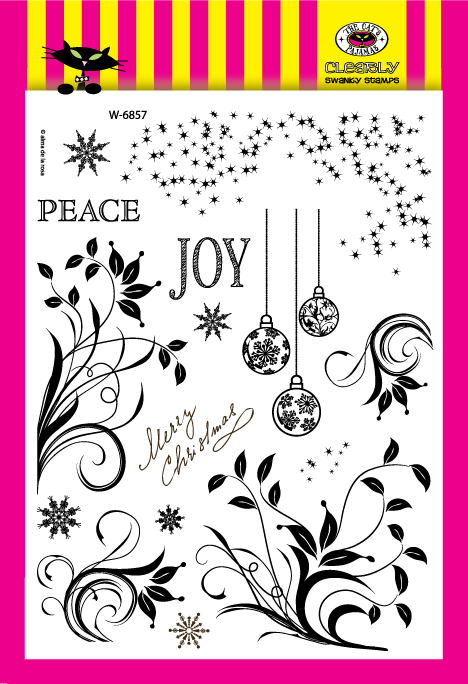 For my first card, I am using the new Snowfall Panel die, Warm Winter Wishes set, Scallop Circles, and the Evergreen Tree Die. 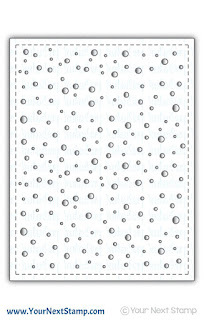 For the background of this card, I cut out the snowfall panel die and the dots cut out were left behind on my cutting mat. Using some Press n Seal, I collected those dots onto it and then added some glue to the backs. Carefully placing it on the card, I pressed it down to adhere it. 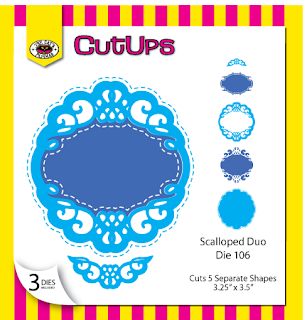 I paper pieced the cup in the main image before cutting it out to be popped up over the scallop circle. 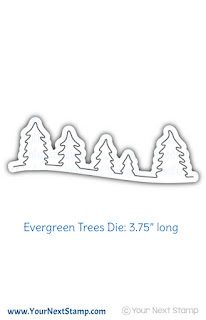 The evergreen trees were added to the sentiment line panel using some shimmer card stock. 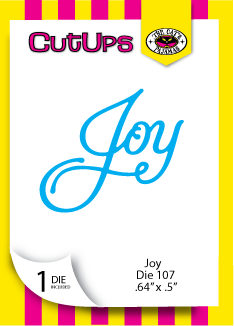 For this card, I kept a CAS look using the build a tree die set and the scripty holiday words. The panel cut out was made using the stitched rectangle die set. As always, Karen has sweetened the deal to allow you to get everything on your list. She is offering 20% OFF your order! Be sure to hop along and leave a little love too! 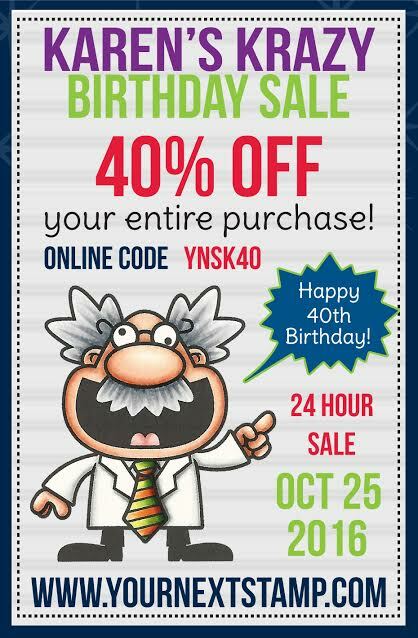 You can have a chance at winning a gift certificate to the YNS Store! Thanks so much for hopping by! 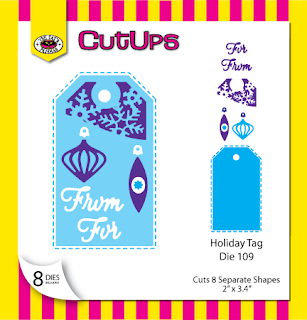 Can you believe it is time for another release with Your Next Stamp? 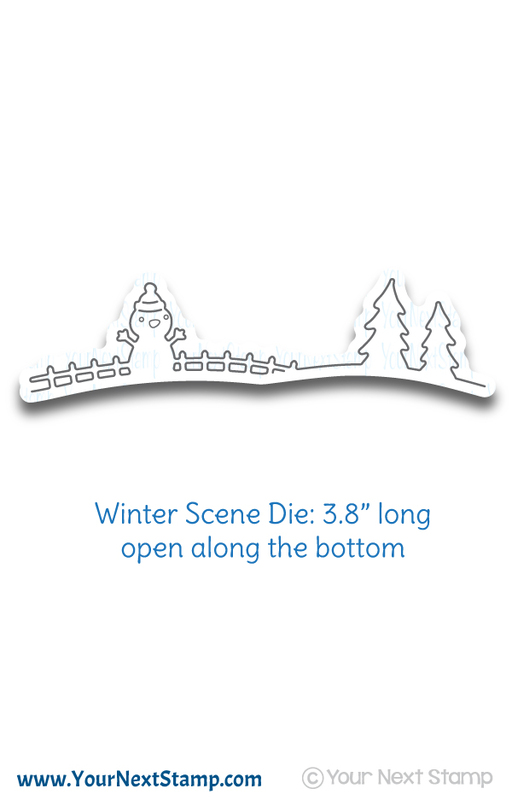 And today starts the sneaky peeks of this super wintery release. Fall is definitely upon us with the cooler weather and rain we have had. This is my favorite time of the year, but nothing ever prepares me for the winter weather just lurking and waiting for me to look like these cute little chicks! I really had to laugh when I saw these images because it really reminds me of me, but I wear more clothes! This CA girl needs her warmth! 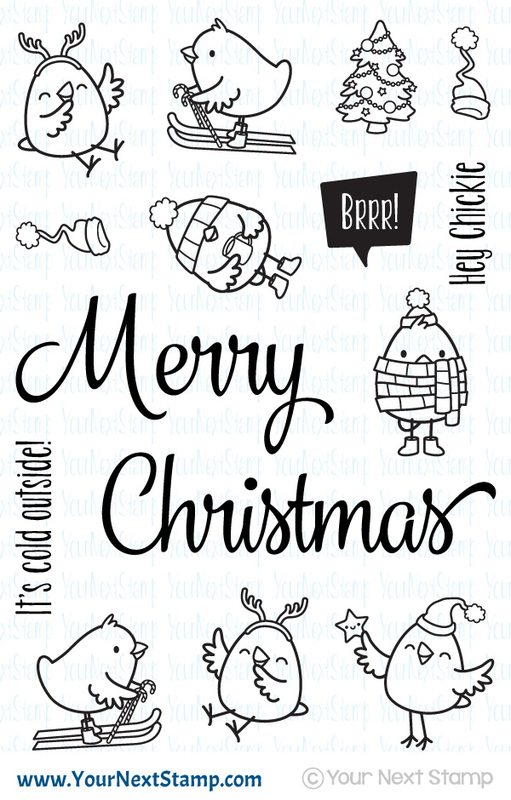 This set is called Merry Christmas Chickie and I paired them up with the Winter Scene Die. The images were colored in with Copics and cut out using the coordinating dies. 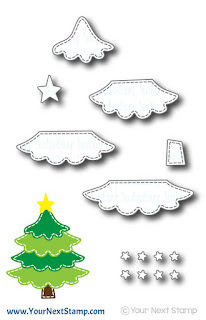 I added some green cardstock to the trees in the scene and used my white gel pen to create some snow. Copics were used to color in the fence and snowman accessories, also using the white gel pen for some snow. 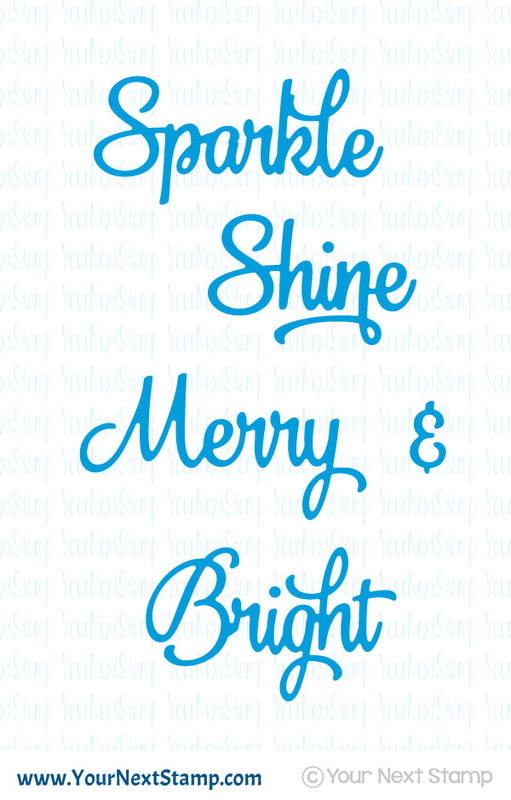 The background patterned paper is YNS's Swirly Fun collection. I popped up the images and stamped the sentiments directly onto the main panel. The card was finished with some Stickles added to the hats and scene line on the snow and some white gel dots for snow on the patterned paper. 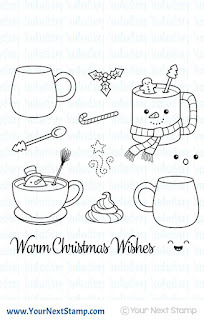 Don't forget to check out all the wonderful creations from the DT and get your list ready. 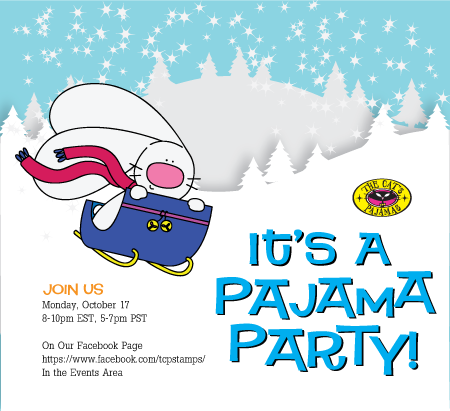 The blog hop begins tomorrow and you don't want to miss out! Before I sign off, I would like to wish my husband a Happy Anniversary today. (He says he reads my blog, so let's just see about that! ;)) 15 adventurous years and I am looking forward to 15 more!